So much to say, but I have to catch a plane early early early in the morning and have just taken a sleeping pill and soon will be asleep. We had Nancy Silverton's meatballs for dinner tonight and they are outstanding and also easy, which is not the case with a lot of dishes from Mozza. Soak bread in milk for a few minutes, mix with veal, pork, ground pancetta, eggs, lots of Parmesan, onion, garlic, and red pepper flakes. Shape into large orbs. Brown in olive oil. Braise for an hour in a mixture of tomato sauce and chicken stock. My husband thinks the meatballs need some spaghetti, but I thought they were perfect as is. 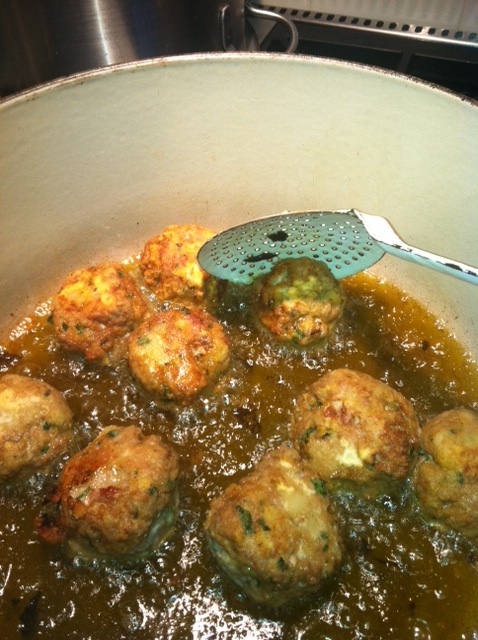 These meatballs are tender and spicy and flavorful and deserve your full attention. 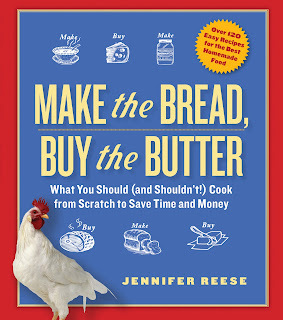 Is the recipe worth the price of the book? It might be if you couldn't get it for free right here. Not on my diet, but y'all shamed me into it. Picture doesn't do the pretty pudding justice. First, you make a butterscotch pudding that is richer and trickier than the butterscotch pudding in Make the Bread, Buy the Butter, but doesn't taste all that different. 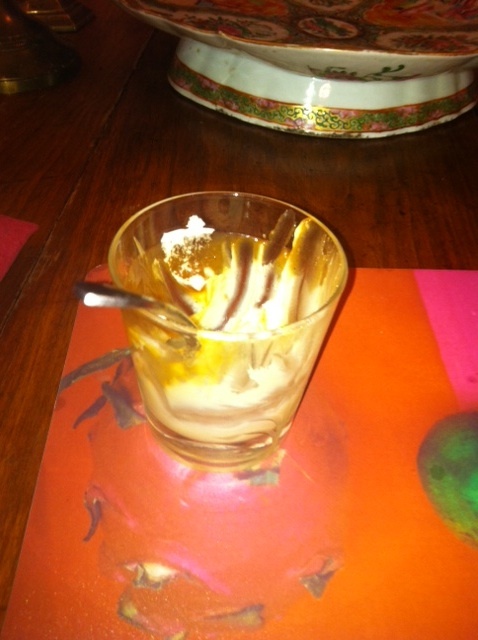 You scoop the pudding into individual glasses and chill, then top with a fabulous homemade caramel sauce. Sprinkle with some sea salt and garnish with a scoop of unsweetened whipped cream. I haven't eaten dessert in months and planned to eat but one wee bite. This was not what transpired. I know I'm supposed to say that it was worth it, that it was soooo good and that I'm not sorry, et cetera, but I can't. It was hard to stop eating this pudding, but it was way too sweet, too heavy, too much. Lacked delicacy. 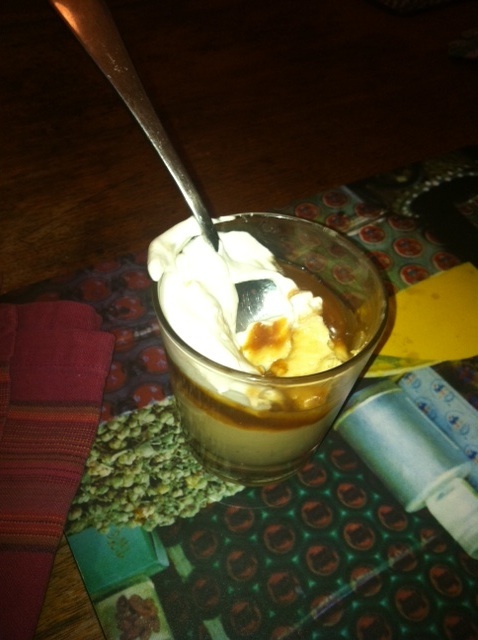 I happen to really love the flavor of plain butterscotch pudding, and felt the caramel sauce smothered it. The recipe is here, though it's slightly different from the version in the book. For one thing, it calls for rum not Scotch. I'd go with Scotch and skip the caramel sauce. In fact, I might skip the pudding altogether. But don't skip those meatballs! Dont EVAH skip the caramel sauce!!! I feel very honored to have my name adorn one of your posts, and I'm happy to hear the dishes I was curious about were outstanding. Thanks so much, Jennifer! Ha Ha - I had the same experience re: Prune (I ordered the same fish) not really knowing anything about it other than my impressions based on the short lived but long missed Restaurant Eloise in Sebastopol opened by Prune ex-pats. I still read the book tho and loved it. Hope you get to the high line.